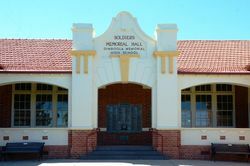 The Dimboola Memorial Secondary College was erected to commemorate those who served in World War One. It is the only memorial school in Victoria erected to commemorate the local residents who fought. A plaque was added in 1999 to commemorate the 75th anniversary of the memorial and in memory of those who served in the defence of the nation. In 1921 it was decided to build a Higher Elementary School. A total of £3442 was raised, £3000 was given to the Education Department and £330 was spent on the honour roll now on the library wall. £16 was spent on the flag pole, with the remainder of the money being spent on clearing the thick mallee scrub. The school, now the school and community library, was occupied in May 1924 and officially opened on 2 December. In 1945 it became a high school with the first form 5 (year 11) class. It was renamed Dimboola Memorial High School in 1947. The Memorial Avenue of trees and Matron Paschke Memorial were constructed in 1949. The building of the Dimboola Higher Elementary School is to be proceeded with. Following upon an interview with Mr. Wettenhall, M.L.A., Sir Alexander Peacock, who is also Assistant Minister for Public Works, has authorised the acceptance of a tender at £7291 for the construction of the school, which will be a soldiers' memorial as well as an educational establishment. The Horsham Times, 30 January 1923. Owing to the illness of a member of his family, Lord Stradbroke was unable to journey to Dimboola on Tuesday to perform the ceremony of officially opening the Soldiers` Memorial School. The services of Mr. A. M. David, State Secretary of the Returned Soldiers and Sailors Association were enlisted, and he successfully carried through the function. The Horsham Times, 5 December 1924. For in this presence they are remembered." Rededicated on the 4th. of December 1999 to commemorate the 75th. anniversary of this memorial.